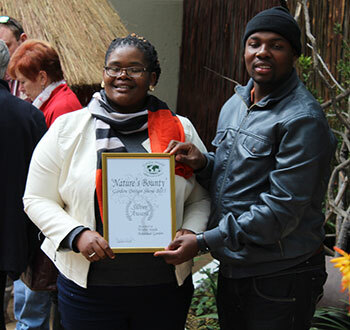 Walter Sisulu NBG added another feather in their cap when the Garden was awarded the Silver Award for the best use of indigenous plants during the 21st Spring Festival themed Nature’s Bounty held at Garden World, Muldersdrift 24 July. The festival is an annual design contest featuring various garden designers and commercial landscaping companies around Gauteng. The event also includes institutions involved in horticultural studies such as universities as well other role-players involved in environmental management such as SANBI and Joburg’s City Parks department. Schools and nurseries also take part in a non-competitive category to inculcate a spirit of horticultural awareness in young people. The festival is also home to the SANBI-Kirstenbosch RHS Chelsea Flower Show exhibit which won a Silver Gilt award in London in May. The exhibit shows the botanical and cultural diversity of a range of geographic locations, botanical gardens and biomes in SA. The Walter Sisulu NBG stand, titled African Medicinal Garden, was designed by Solomon Nenungwi and Edward Nkoana. It depicts an African rural life scene that features a hut surrounded by various indigenous plants that are used medicinally including an Aloe ferox hybrid, Pelargonium tomentosumand Crassula arborescens, amongst others. African pottery and other artifacts such as drums, wooden seats as well as flowers also formed part of the exhibit. Walter Sisulu NBG Curator, Ms Xoli Mokoena, received the award on behalf of the Garden, saying she was elated to be part of the winning team.